Song: "Goe and catche a falling starre"
Song: "Sweetest love, I do not go"
To Mr. T. W. "All hail sweet Poet"
To Mr. T. W. "Haste thee harsh verse"
To Mr. T. W. "Pregnant again with th'old twins Hope, and Fear"
To Mr. T. W. "At once, from hence"
To Mr. R. W. "Zealously my Muse"
To Mr. R. W. "Muse not that by thy Mind"
To Mr. C. B. "Thy friend, whom thy deserts"
To Mr. E. G. "Even as lame things thirst"
To Mr. R. W. "If, as mine is, thy life a slumber be"
To Mr. R. W. "Kindly I envy thy songs perfection"
To Mr. S. B. "O thou which to search out the secret parts"
To Mr. I. L. "Of that short Roll of friends"
To Mr. I. L. "Blest are your North parts"
To Mr. B. B. "Is not thy sacred hunger of science"
To the Countesse of Huntingdon. "That unripe side of Earth"
To Mrs. M. H. "Mad paper stay"
To the Countesse of Bedford. "Reason is our Soul's left hand"
To the Countesse of Bedford. "You have refin'd me"
To the Countesse of Bedford. "T'have written then, when you writ"
To the Countesse of Bedford. "This twilight of two years"
To the Lady Bedford. "You that are she"
To the Countesse of Bedford. "Honor is so sublime perfection"
To the Countesse of Bedford. "Though I be dead, and buried"
To the Countesse of Huntingdon. "Man to God's image, Eve, to man's was made"
To the Countesse of Salisbury. 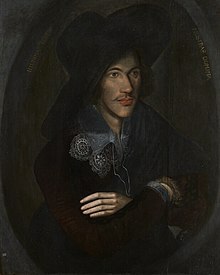 "Fair, great, and good"
Holy Sonnet: "Batter my heart, three person'd God; for, you"
Holy Sonnet: "Death be not proud, though some have called thee"
"Donne, John (1573-1631)," in Dictionary of National Biography, London: Smith, Elder, & Co., (1885–1900) in 63 vols. “Donne, John” in Encyclopædia Britannica (9th ed., 1878). Grierson, Herbert J. C., "English Poetry" passim in chap 4 of The First Half of the Seventeenth Century, vol. 7 of Periods of European Literature Series, George E. B. Saintsbury, ed., Edinburgh: William Blackwood and Sons, (1906) in 12 vols. This page was last edited on 5 February 2019, at 15:53.